When I was a boy in the 1940s, my parents purchased a Toronto Daily Star newspaper route. Six days a week, I delivered papers to about 65 customers. The newspapers were 3 cents a copy, but 10 cents extra on Saturday, if the customer bought the Star Weekly magazine section. For each newspaper I received a half cent for delivery. I considered the roughly $2 a week I earned to be a princely income. I retained my route until I was in grade nine, when I sold the route to become a delivery boy for Crosstown Pharmacy, at Eglinton and Bathurst. I was paid about 30 cents hour, and the customers’ tips were more lucrative than on the paper route. I had been an avid comic-book reader when I was in public school, one of my favourite being Superman, featuring the fictional characters — Lois Lane and Clark Kent. I did not realize that in the 1930s, the creator of the comic, Joe Shuster, had also been a paperboy for the Star. The head office of the Toronto newspaper was the inspiration for the Daily Planet, where Clark Kent was employed. I do not personally remember ever seeing the Star building, but after researching it and examining photos of it, I can understand why it gripped the imagination of Joe Shuster. The Toronto Star, established in 1892, relocated in 1905 from Adelaide Street to a four-storey building at 18-20 King Street West. In the decades ahead, it constantly increased its circulation. Writers like the Nobel-prize winning Ernest Hemingway added to the newspaper’s reputation. Hemingway worked at the Star from 1920 to 1924 and credited the freedom to travel and write for the Star a major reason for his future success as an author. In the late-1920s, with a circulation of 175,00 and 650 employees, the newspaper relocated to a larger building at 80 King Street West. It was one of the finest Art Deco office towers ever built in North America. Symmetrical in design, its construction commenced in November 1927, and completed in January 1929. At a cost of $1.5 million, it was designed by Chapman and Oxley. A classical example of the style, it possessed strong vertical lines that ascended from its six-storey podium to the pinnacle of the tower. Containing 22 storeys, there were no setbacks on the front facade, facing King Street, but there were setbacks on the east and west sides, allowing the tower to rise from the centre section above the sixth floor. The tower (floors 7-22) was erected with structural steel and faced with limestone. It was mostly rented to other companies for offices, helping to offset the expense of maintaining the building, as well as providing investment income for the newspaper. The Star’s radio station was on the 21st. floor of the tower, station CFCA, which ceased broadcasting in 1933. The six-storey podium was constructed of reinforced concrete, its ground floor occupying two-storeys. The lower three floors were faced with granite. The podium was where the daily operations of the newspaper were located, including the printing presses and delivery facilities. It also contained the offices for the reporters, proof readers, editors, photographers, and the newspaper archives. Above the entrance doors, there was a decorative bronze screen, typical of many Art Deco structures. Atop the screen was an arch, and above it was stonework with carved floral motifs. It was a grand entrance, important in an era when celebrities and politicians were often interviewed at newspaper offices, rather than having reporters seek them out. The ground floor contained rental stores that included a barber shop. On its east side there was a restaurant, which for many years was operated by Stoodleigh’s. This restaurant chain also had an outlet on the north side of the CNE Grandstand, which was only in operation when the Ex was open. The lobby on the first floor of the Star building was elegant, with marble columns and trim. Elevators with bronze doors, etched with Art Deco designs, swept visitors and employees to the upper floors. Each elevator was staffed by an intendant with white gloves, who opened and closed the doors and provided assistance. Anyone who remembers Eaton’s and Simpsons during the 1940s and 1950s, would be familiar with this type of service. The trucks that delivered the newspapers across the city departed directly from the Star building on King Street. When I was a paperboy, one of these trucks arrived six days a week, around 4 pm, at a depot at Vaughan Road and Greyton Avenue, in the Township of York. About 20 newspaper boys picked up their bundles of papers from this location. There were no newspaper girls in the 1940s. In 1967, the TD Centre (Toronto-Dominion bank) opened on the south side of King Street, directly across from the Toronto Star Building. As the area was the heart of the city’s financial district, the newspaper received lucrative offers from those who wished to redevelop the site. Finally, in 1971, the Star finally sold their building and relocated to the foot of Yonge Street (1Yonge), near the harbour. The wonderful Art Deco Star building was demolished in 1972, and in its place appeared the 72-storey First Canadian Place office complex, directly across from the TD Centre. The Art Deco-inspired bronze doors from the Star Building were relocated to an office structure on Bay Street, south of Queen Street. I was unable to discover exactly where, but a reader suggested that they are likely in the Metro Trust Building at 357 Bay Street, north of Temperance Street. Some of the Star building’s ornate stonework was transported to Scarborough and placed on the grounds of the Guild Inn, alongside similar remnants of carved stone from other demolished Toronto edifices. I understand that some of Toronto’s architectural past must be replaced to meet the needs of a modern city. However, our city has destroyed so many of its structures of yesteryear that little remains to link us with those who laboured to build Toronto. A truly modern, progressive city retains the best of its former years and incorporates it into the present-day. This concept is gaining ground in Toronto, but it still has a long way to go. Other cities have accomplished this blend, and are the better for it. They attract more tourists and have an improved urban environment, while creating an enriched life for their citizens. 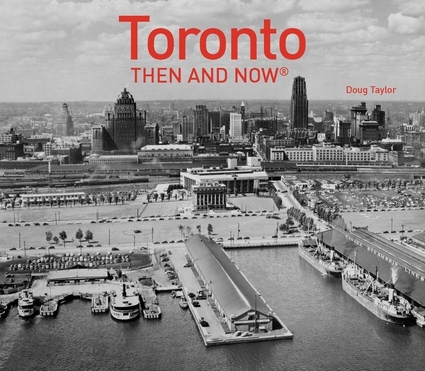 Sources: www.thestar.com (Dave Russill) – www.canadacolll.com— “Lost Toronto” by William Dendy, “Art Deco Architecture in Toronto” by Tim Morawetz. Location of the old Star building on King Street West. The front of the Star building at 18-20 King Street, prior to the newspaper relocating to 80 King Street. The photo was taken during the federal election of 1911, when the main political issue was reciprocity (free trade) with the United States, Toronto Archives. F1244, Item 0342. All of the above buildings on King Street (except the three on the far left) were demolished in 1927 to construct the Star building. Toronto Archives, F1244, Item 3012. The Star building shortly after it opened in 1929. View gazes east on King Street toward Yonge. Ontario Archives, 10022003. Office space for reporters in the building on December 17, 1930. Toronto Archives, F1244, Item 2054. Lobby of the building c. 1930, Toronto Archives, F 1244, Item 2057. King George V1 and Queen Elizabeth in Toronto in 1939, in front of the Star building, which was decorated for the Royal Tour. Toronto Archives, F1244, Item 2186. The newspaper’s offices c. 1945, Toronto Archives, F 1257, S 1057, Item 2037. First Canadian Place in March 2016, on the former site of the Toronto Star Building. The TD Centre is on the south side of the street, opposite it.